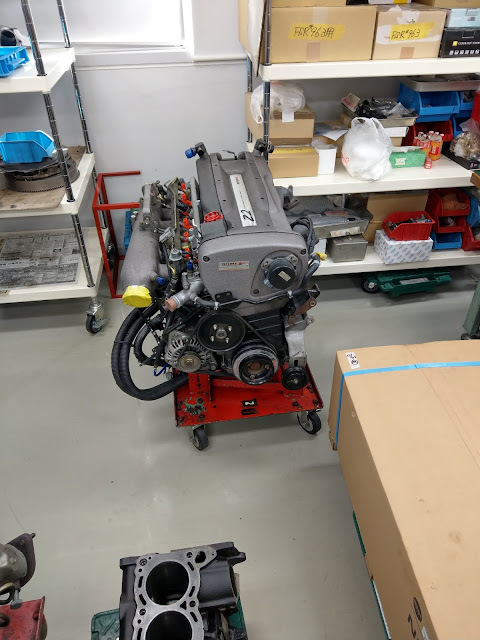 Those of you whom follow Ale's blog would already be aware that his BNR34 is currently undergoing a full restore from a complete engine and interior rebuild and body respray. 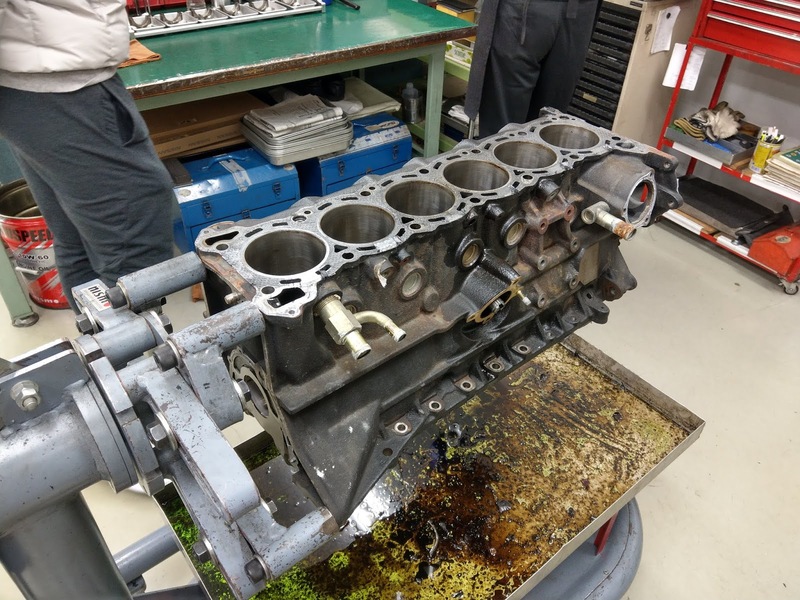 I was able to see this engine, a N1 spec RB26 (as was given to the Vspec II Nur BNR34s) in a completely disassembled state. Despite his engine having lived it's life from new in an completely factory, unmolested state. Regardless however after 80k kms of driving it was certainly due in for an overhaul/rebuild. These are what the pistons of a well driven RB look like. Kosaka-san and Ochiai-san mentioned that Ale's engine has been driven well. The RB26 is a high reving race engine so it's clearances are designed to be reved out and driven hard. The tell tale signs of a well driven engine is the carbon does not go below the rings as can be seen above. 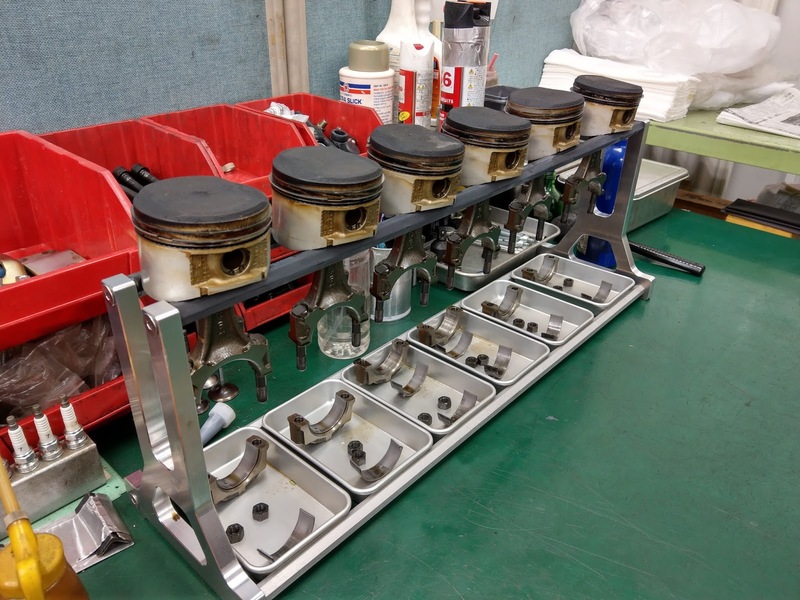 If an engine has been solely driven at low RPMs the black carbon on the piston will go below the piston rings onto the lower part of the skirt. The gentleman on the left, Kosaka-san first cut his teeth at Nismo building FJ20 Skyline Group A engines, following then followed the evolution of the Skyline into the RB era starting with the RB20DET-R of the R31 GTS-R Group A race cars and then onto the BNR32 Group A. 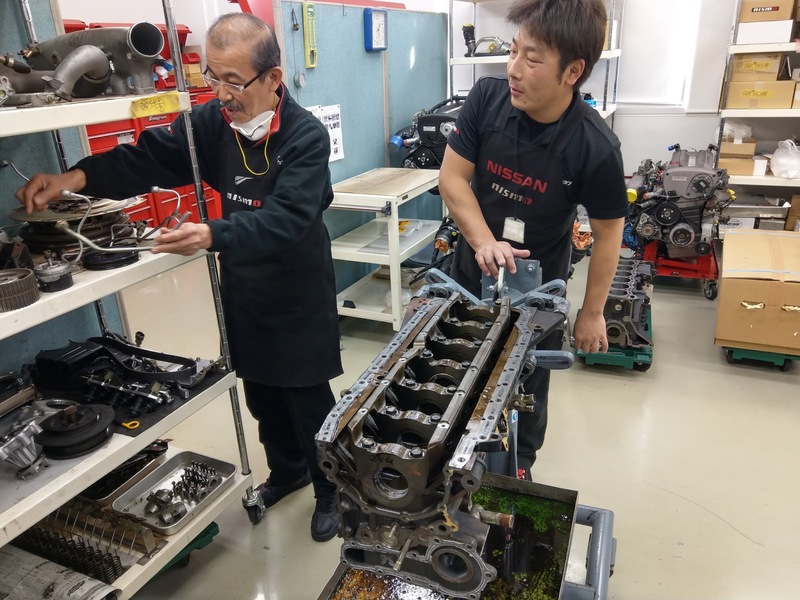 In 1998 he transitioned to Nismo's Omori Factory workshop to work on road car engines and has since worked on a total of over 1000 engines and has built the greatest number of RBs of any person in the world. Kosaka-san will be in charge of building Ale's engine. Nismo offers various menus for it's customers to choose from for their RB engines. The introductory spec, if you call it that is the "S2" spec RB engine . As the number suggests it is the evolved form of the S1 engine found in my car (see my previous post for details on the S1 engine). Here is a graph taken courtesy of Nismo's site. The solid line is the power and dotted is torque curve. The green curves represent a stock RB26, The blue the S1 and the red the S2 engine's torque and power curves respectively. It retains the previous 400hp spec of the S1 but with improved torque and power delivery at low RPMs thanks to the addition or R35 injectors, new revised cam shafts and a S2 ECU. On top of this the other differences are the addition of a metal head gasket (S1 uses the stock organic one) and a switch to an N1 block (more on this later). Like the S1 before it the "S" stands for "Street" and so the engine is tuned for street and spirited driving use so is tuned for low end pick up and response rather than top end punch so provides a very linear and progressive power and torque delivery. The "R2" RB engine as you can probably guess is the track day spec engine with the "R" standing for "Race". Like the R1 engine before it and like the S1 vs S2 comparison it is an R1 with the R35 injectors, revised cam shafts and R2 ECU. Same as with the above S2 graph, this graph courtesy of Nismo's official site shows the power (solid) and torque (dotted) curves. Green is a stock RB26, blue is and R1 engine and Red is R2. The engine is basically a complete N1 engine with special R1 turbos, cams and ECU and R35 injectors as per the S2. The engine is designed to provide mid to high RPM power and torque delivery to give strong acceleration out of corners. The power is rated at 450hp which doesn't sound like much on paper over the S2, however it is all about the delivery of that power. The concept of this engine is an engine you can thrash at the track and then drive home with no issues. The most expensive spec engine by Nismo is the F-Sport R 2.8 (a 2.7 liter version is also available) engine. 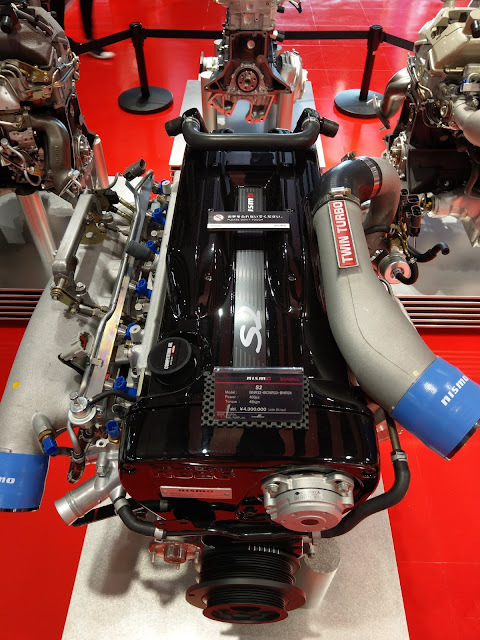 This engine is a real gem of an engine as it utlises the legendary RRR block from the Z-Tune's Z2 engine along with the crank conrod and pistons from the Z-Tune parts bin giving it an identical bore and stroke as the Z-Tune's Z2 engine. It However uses the R1 turbos instead of the bespoke ones exclusive to the Z-Tune. The cams and ECU are also of a more milder spec and while the F-Sport in 2.8 litre spec still develops 500hp. When compared to the Z2 engine's race engine like tune the F-Sport R 2.8 is tuned to have a more broad and smoother power delivery think of it as the ultimate grand touring spec for the RB26. There have been many arguments, myths and legends surrounding the famous RB26 engine. There are many wives tales and theories regarding which blocks are weak and which are the strong blocks. 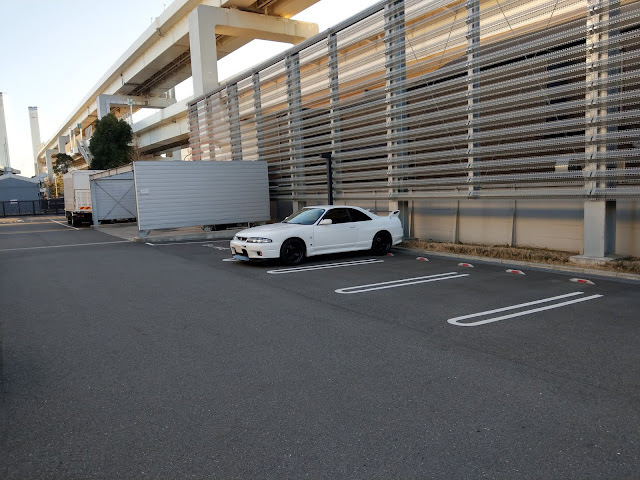 Before we get into this a bit of background on the RB26 engine and the car it was developed for, the Skyline GTR BNR32 https://en.wikipedia.org/wiki/Nissan_Skyline_GT-R#Third_generation_(1989%E2%80%931994). 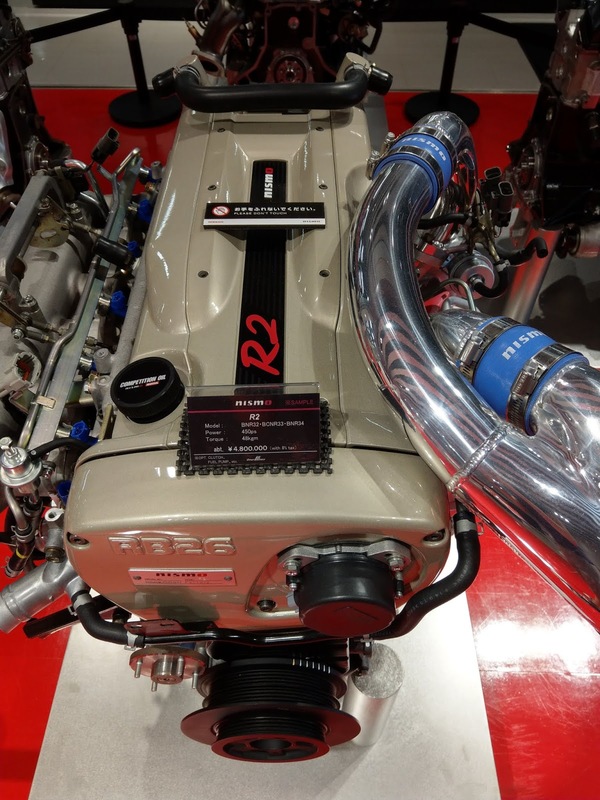 As we all know the RB26DETT engine was developed for the Skyline GTR BNR32 which was a car homologated for Group A Touring Car racing. 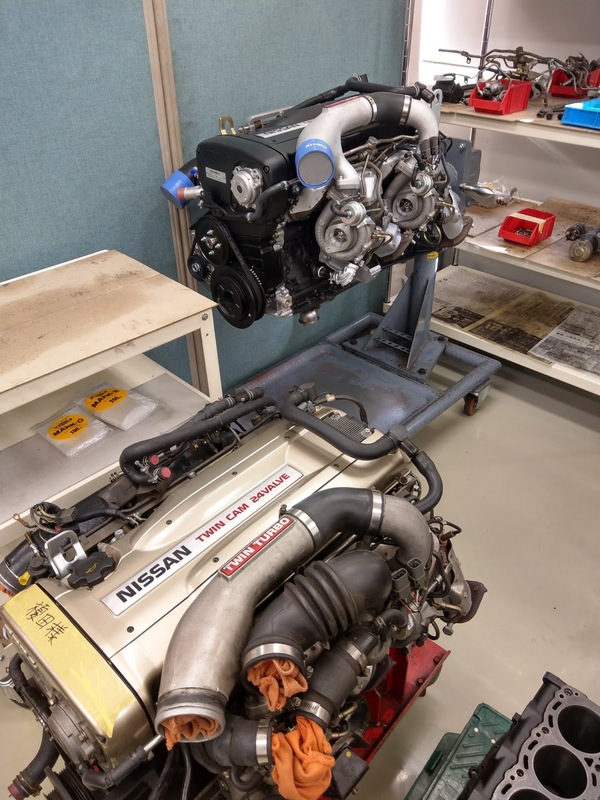 The engine the RB26 DETT https://en.wikipedia.org/wiki/Nissan_RB_engine#RB26DETT was an engine designed with the Group A regulations in mind. The engineers calculated that with an AWD drivetrain the car should be able to put down 150hp per wheel. This resulted in the RB26 designed to produce and operate at a power range in the region of 600-650hp. This is something I want you to keep in mind as you read on. I asked the Kosaka-san and Ochiai-san about this and they brought up a simple yet very valid point of reference. Basically their reference point for their engines is their engine test bench which all newly put together or overhauled engines have to endure. The engine is solidly mounted to the test bench which means this is the worst possible environment an engine can be put through. This is how Nismo have learnt about the various block types. The two main blocks available are the 05U standard block and the N1 (24U) block (recently put back into production). So I asked them about the 05U block and they simply replied most of their team will refuse to work on this block as they have a high risk of developing issues during or after being subject to the test bench. This is why even for the S2 engine is now speced with an N1 engine block which they report there have never had issues with. 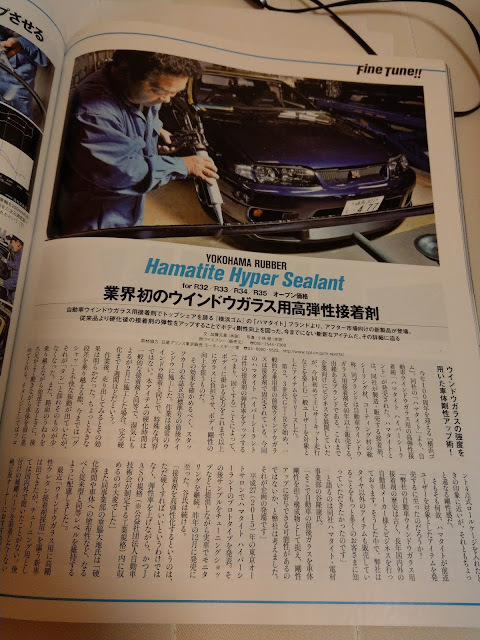 They mentioned that the 05U is fine when mounted in a car which has various dampening elements such as rubber engine mounts, suspension, tyres and even the body. However not recommeded for reliable high power applications as was also found by the first Group A non N1 blocked BNR32 teams. If you think back to your high school geology text books you will remember all solids have lines of cleavage (ie lines along where if exposed to enough shock they will sheer.). For example if you were to hit a diamond with a steel hammer it will shatter along certain lines despite it being the hardest natural occuring substance. Then if you look at the nature of the an engine test bench which essentially puts the engine through an extreme shock test, a harder substance with less ability to absorb shock would sheer along it's lines of cleavage. So now I am sure you have put two and two together and Omori Factory's view of the 05U block vs the N1 block. This (Ale's) block is an N1 with 80k kms and is still perfectly fine to be reused. Although yes it has never been boosted which also does help with longivity. 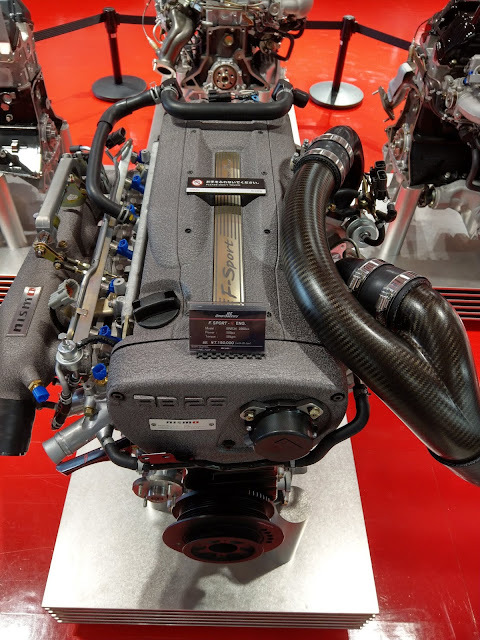 My overall takeaway is that as mentioned above the RB26 is an engine design around the parameters of having a maximum output of 600hp and even at that range you are reducing the service life of the engine which is why Nismo engines are speced at a range slightly below what the engine's design spec as these engines are speced for road cars now and not for the race environment of the past which is an environment where an engine is disposable. That said engines are ultimately disposable. Over a long term with Kosaka-san telling me an RB will begin to loose power after 60k kilometers from new and and an N1 block can be rebored twice before it cannot be reused again which when I heard this really put into perspective the mortality of that is the reality of engines. "Memento mori". In this day and age where making power from an internal combustion engine is no longer a feat and new cars are becoming increasingly numb and detatched from the driver it is now more about the experience and sensations we get when we are behind the wheel. The RB Skylines have reached the "modern classic" status. We as enthusiasts should treasure these engines more and take care of them in ways which does not dilute their original character for many hundreds of thousands of kilometers to come.